Down the Rabbit Hole We Go...: The Most Wonderful Cat in the World. The Most Wonderful Cat in the World. After looking at literally hundreds of pictures/videos of cats online over the years, I've realized that I have the prettiest cat ever. Not only is she pretty, she's exceedingly well behaved. When she was an indoor cat, she never, ever, ever scratched or went on the furniture. She's so well-behaved and so obedient that my husband has a warped perception of the ability of animals to comprehend instruction. One day he came in the house, thoroughly disgusted. I asked what was wrong and he said, "I told the cat to stay off of the patio furniture, but she's been sleeping on one of the chairs and now it's covered in hair." To which I replied, "You realize she's a cat, right?" And he said, "Ya, but usually she does whatever I tell her to." She used to be an indoor cat, then was an indoor/outdoor cat and is now an outdoor/garage cat. She loves to hunt and leaves us presents of birds and mice in the backyard, sometimes more than one at a time. She walks with us twice a day as I take my oldest daughter to and from school. Last fall at our school's Halloween dance, I told her to go home after she walked to the school with us. 1.5 hours later as we walked down the dark sidewalk, I heard meowing and realized that she had sat there waiting for us the whole time. People used to stop us on the street to say, "Do you know that there is a cat following you?" But now they're used to seeing her and just smile and wave. She played fetch when she was a kitten. She comes whenever she is called. Perfect, right? We got her when she was around 6 months old from my cousins Irene and Amy, and she already had a name, but I changed it to Scout, after the character of the same name in the book To Kill a Mockingbird. She is very small, everyone mistakenly thinks that she is a young cat, not yet full grown, when in actuality she is 9 years old. Her behavior became odd when I was pregnant with my oldest. She was crazy about being with me all the time. When I came home from work and laid in bed all evening from exhaustion, she would snuggle beside me the whole time, and had to be near me constantly. If I tried to close a door so that she would leave me alone, she would lay on the other side, mewing piteously and reaching her paws under the door. Our vet came to give her shots, so we asked about Scout's strange behavior. We were a bit concerned about jealousy issues after the baby was born. The vet told us that cats can sense when women are pregnant, something to do with hormones or pheromones and it can make them a bit crazy, but that they are fine once the baby is born. She was right. I came home from the hospital and Scout was back to normal. Scout is how my husband knew his sister was pregnant without her telling him. He walked into the apartment, saw how the cat was all over his sister (who Scout didn't usually pay much attention too) and asked if she was pregnant. She was. 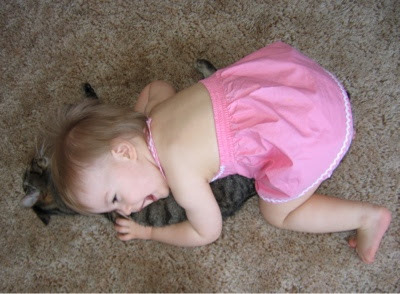 Scout was always longsuffering with our oldest daughter, who would hug her so enthusiastically that she would end up laying on her and the cat just stayed there, squished under a fat baby. It's Mike who doesn't like having Scout in the house (cat hair) which led to my oldest asking me one day, "If something happens to Daddy, can Scout come and live in the house again?" It was hard not to laugh, and I replied, "Yes, but you shouldn't hope that something happens to Daddy just so the cat can live in the house again." We got a chart in the mail that tells you how old your pet is in cat years, and I was sad to see that she is about 52 yrs old. The girls fight over who is going to have her when they are grown up and live on their own. I don't have the heart to tell them that she probably won't be around then.